The resolution, passed by 494 votes to 135, with 69 abstentions, says that EU-Russia relations are profoundly damaged by Russia’s deliberate violation of democratic principles, fundamental values and international law with its violent actions and Moscow’s destabilisation of its neighbours. The EU must now devise a “soft-power” contingency plan to counter Russia’s aggressive and divisive policies, they said. This means that the EU, which has no army, should further use non-military means to discourage Russia from destabilising its neighbours and undermining the EU. MEPs also call on EU countries to refrain from cuttingh bilateral deals with Russia which could harm this unity. This message is basically aimed at Greece, Hungary and Austria, which have plans to help build a pipeline bringing Russian gas from Turkey via Greece, Macedonia, Serbia and Hungary, to the Baumgarten hub, near Vienna. To ensure solidarity amongst the member states, a robust, rules-based European Energy Union should be created swiftly, MEPs add. “With its aggression against Ukraine and annexation of Crimea, the Russian leadership has put our relations at a crossroads. It is up to the Kremlin to decide now which way it will go – cooperation or deepening alienation,” said the EP rapporteur, Gabrielius Landsbergis (EPP, Lithuania). “I am convinced that the Russian people, as all of us, want peace, not war. A change in Russia can, and will, come from within. Meanwhile we must send a strong message to the Russian leadership that we stand united with the victims of its aggression and those who stand for the values the EU is founded on,” Landsbergis added. However, it is unlikely that a change in Russia may occur soon. In fact, the ratings of Russian President Vladimir Putin have only raised since the annexation of Crimea in March 2014. MEPs also stated that Russia is directly or indirectly, involved in a number of ‘frozen conflicts’ in its neighbourhood – in Transnistria, South Ossetia, Abkhasia and Nagorno Karabakh – that constitute serious impediments to the development and stability of the neighbouring countries concerned and to their rapprochement with the EU. MEPs are also alarmed that Russia is positioning itself as a challenger of the international democratic community and its law-based order, and is supporting and financing radical and extremist parties in the EU. Perhaps the best known example is France’s National Front, which received large loans from a Russian bank in 2014. They call for a coordinated mechanism to be set up by the Commission and EU member states to monitor financial, political or technical assistance provided by Russia to political parties and other organisations in the EU, and to assess its influence over political life and public opinion. The Commission should also propose legislation ensuring the full transparency of political funding and financing of political parties in the EU by stakeholders outside it, MEPs say. The resolution also condemns the “arbitrary” Russian blacklist banning 89 EU politicians and officials from its territory as an infringement of international law, a violation of universal standards and an impediment to transparency. Russia has imposed an entry ban on 89 European politicians and military leaders, a move that has angered Europe and worsened its standoff with the West. This act is “counterproductive and detrimental to the already weak channels of communication”, MEPs regret, underlining that those targeted should be informed of the motives and have the right to appeal before an independent court. MEPs say that in the long run, a constructive and predictable relationship between the EU and Russia is desirable for their mutual benefit but stress that cooperation can only be resumed if Russia respects the territorial integrity and sovereignty of Ukraine, including Crimea, implements the Minsk agreements in full and halts the destabilising military and security activities at the EU’s borders. A separate resolution on the strategic military situation in the Black Sea Basin, following the illegal annexation of Crimea by Russia will be put to a vote today (11 June). 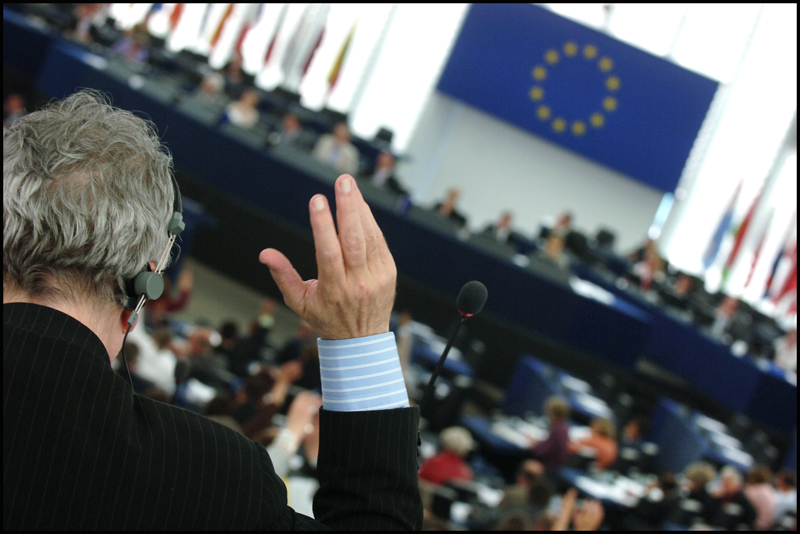 Among the MEPs who voted against the resolution are almost all members of the leftist European United Left-Nordic Green Left (GUE-NGL) political family, almost all MEPs from the anti-EU group Europe of Freedom and Direct Democracy (FDD), almost all non-affiliated MEPs from far-righ forces such as the French Front National of Greece’s Golden Dawn. From the mainstream groups, two MEPs from EPP voted against, Remoa Sernagioto from Italy and Hermann Winkler from Germany. From the S&D group, three Bulgarian, one Latvian and one Czech MEP voted against, and from the liberal ALDE group an Estonian MEP, Yana Toom, voted against. "This blacklist is a list of honour. I feel proud to be on this list together with colleagues who stand firm for Ukraine and against Putin's aggression." "There is no quick fix. We should be prepared to endure the consequences for years to come. Putin, however, will not win. His Achilles heel is the structural weakness of the Russian economy. Western resolve and the poor state of the Soviet economy brought down the Soviet Union. The same will be the case with Putin's Russia." Russia annexed Crimea in February 2014, but denies involvement in the Ukrainian breakaway regions of Donetsk and Lugansk. LOL …. Pot calling the kettle black! The west’s hypocrisy just keeps on rolling.